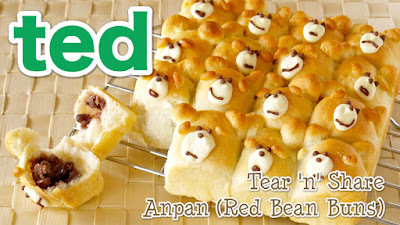 Tear 'n' Share bread is going viral in Japan, so I decided to make ted buns filled with homemade sweet Azuki red bean paste. Yummy!!! 6. While proofing, divide Anko (Azuki Red Bean Paste) into 16 pieces and roll them into balls. Grease the pan with some oil or butter, OR line with parchment paper. 10. Cut off small pieces for the ears and brows. Using a rolling pin or your palm, flatten out the dough. Wrap Anko (Azuki Red Bean Paste) and pinch to close. Attach the ears and brows, then place it in the square pan. 13. If the ears and brows are coming off, press and attach them with a toothpick. 14. Bake at 180C (350F) for about 20 minutes or more. 15. Remove from the pan and place it on a wire rack to cool. 16. When the bread is completely cool, melt the chocolates in pastry bags. Snip off the end, then draw the faces on each of the rolls.